Will an Escape-Proof Crate Fix My Dog's Separation Anxiety? Do you find yourself wondering where you can buy a better, stronger, indestructible crate? Is your dog escaping their kennel, or destroying it while you’re away? This issue may be less about the quality of the crate you’re using, and more about the quality or your training. Let’s be clear here: an escape-proof dog crate can be a good way to keep your dog safe and keep your dog from destroying your house while you’re away. But if your dog has separation anxiety, he needs more than an indestructible crate. He needs help from an expert dog behavior consultant. Rather than looking for the world’s most indestructible dog crate, it might be time to look at why your dog is constantly destroying his crate. It’s possible (even likely) that your dog is feeling very stressed, and that’s why he’s destroying his crates. You first have to rule-in/out whether your dog is experiencing separation anxiety. Separation anxiety is distress induced by the absence of you and/or a family member or from being isolated. Dogs with separation anxiety often attempt to destroy or escape their crate. They may hurt themselves in the process, which is why training is so important! 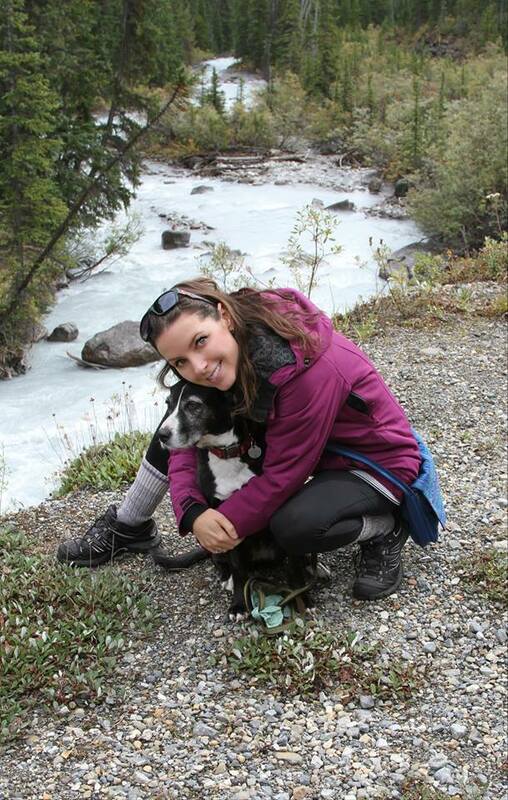 Journey Dog Training works with separation anxiety through a self-study online separation anxiety course. Enroll today! Separation anxiety can look a lot like isolation distress, a medical issue, or even improper training. 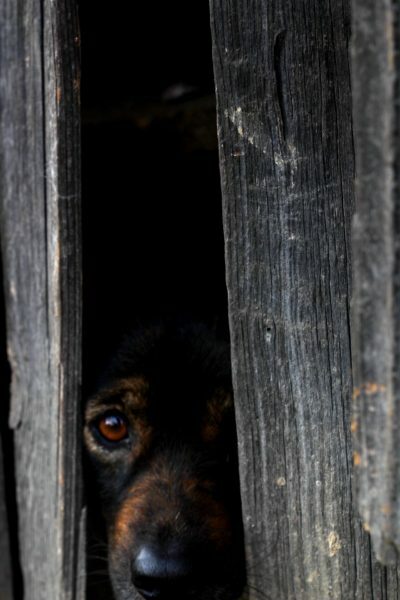 Isolation distress occurs when a dog is left alone, whereas true separation anxiety occurs when separated from a specific person. If your dog has isolation distress, the presence of any person can alleviate their distress. For many people, the difference between separation anxiety and isolation distress doesn’t make a big difference. But it’s nice to know if you can leave your dog with someone else for support, or if being away from you is the problem! Barking. Vocalizing when left alone. Do your neighbors complain about constant barking? Panting and drooling. Excessive panting/drooling is a sign of stress. Do you find puddles of water or drool at home after you were gone? Or is their fur wet with saliva? Pacing or shaking. Is your dog unable to settle? If your dog is unsettled, you may see them pace back and forth. Shaking or trembling can occur when a dog is distressed as a natural response from the body. Not wanting to eat food/treats. Does your dog turn up her nose at her favorite treat while you’re gone? When I am feeling anxious about a test or big presentation, food is the last thing on my mind. When your dog is anxious about you being gone, she feels the same way. Destruction of crates, bedding, or other household items. Are you constantly replacing bedding or buying new crates? Excessive licking. Does your dog spend several minutes or even hours of time licking their paws or the floor of their crate while you’re away? Licking might a sign of stress. You might notice that your dog’s paws are wet or the fur is dried in little triangles — this is a common sign of overgrooming. Soiling the house. Urination and or/defecation when otherwise house trained is a sign of anxiety. Stress signals/ body language. Be aware of the signs of stress in dogs. This is how dogs communicate. Lip licking, yawning, stiff body, pursed lips, panting, averting eye contact, lowering head and neck, trying to hide, and other signs might be present when you are getting ready to leave or when you are gone. Your dog might have one, two, or even all of these signs of separation anxiety. Further, you might notice that when one of these signs disappears, a new one quickly takes its place. Medical issues can often look similar to behavior problems (they’re often related, too). If your dog suddenly starts urinating in the house while you are gone, it could be due to a medical issue such as a urinary tract infection (UTI). Not only could this lead to soiling in the house, but your dog could show other signs of distress seen in separation anxiety. Improper training can also look similar to separation anxiety. Do your neighbors report that your dog barks while you are out? This could be a symptom of the distress caused by separation anxiety or isolation distress. But, it could also be your dog reacting to sounds they hear outside and simple management or training could fix the problem. Separation anxiety or isolation distress (we’ll just say separation anxiety from now on) manifests in a number of ways. You can film your dog to figure out what’s going on while you’re gone. A dog without separation anxiety will normally sleep the majority of the time you’re away. If you think your dog might have separation anxiety (and even if you don’t), you should try videoing or watching your dog using a remote camera system to look for one or more of these signs of distress. Why Does My Dog Hate His Crate? Is An Indestructible Crate My Only Option? A crate is not always the right solution for separation anxiety. I do think that sometimes an escape-proof dog crate can absolutely be a great management tool for dogs with separation anxiety. It can keep your dog safe (and prevent him from destroying your house). Even if an indestructible crate helps keep your pet safe in the short-term, your dog will thank you for seeking help with her anxiety going forward. However, when a dog is distressed about being alone as a symptom of their separation anxiety, confining them to a small space (like an escape-proof dog crate) can elevate her stress level. Let’s explore why your dog might try to destroy his crate. Confining your dog to an indestructible crate, an exercise pen, behind a baby gate, or closing a dog in the bathroom or bedroom can help to prevent the destruction of household items or soiling the house while you’re away. Separation anxiety is essentially a panic attack that your dog has whenever you leave her. Behavior modification (see below) is necessary, and medication might help. Dogs with separation anxiety can cause lots of destruction to their supposedly escape-proof crate or another confinement tool. Many people feel as though an escape-proof dog crate is their best solution. But this can actually cause more self-injury to your dog while they’re confined because she simply tries harder to escape. Instead of broken doors, they may have broken teeth or nails (or worse). 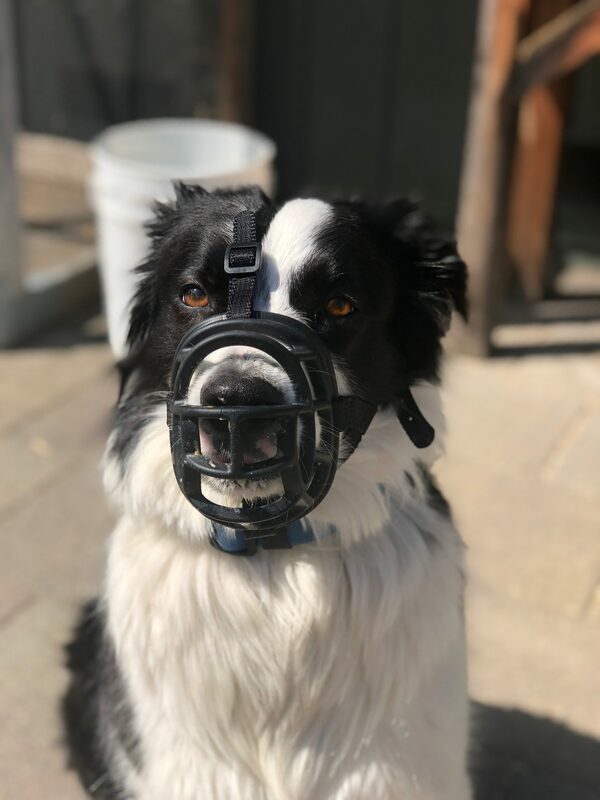 Training can help keep your dog from hurting his teeth or nails when trying to break out of an escape-proof dog crate and helps keep your home safe from your dog’s panic attack. This brings me to barrier frustration. 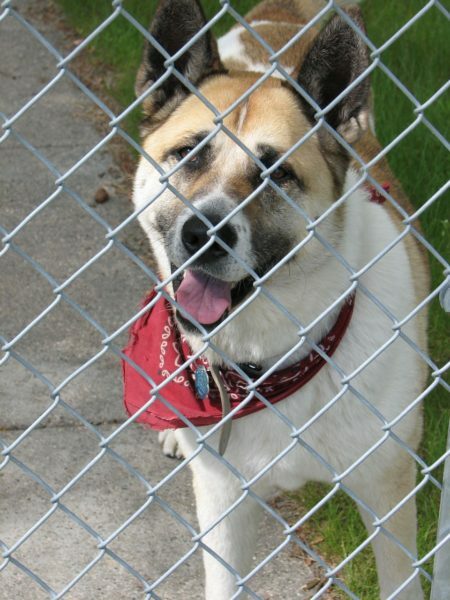 Many dogs with separation anxiety feel more frustrated and more anxious when confined. 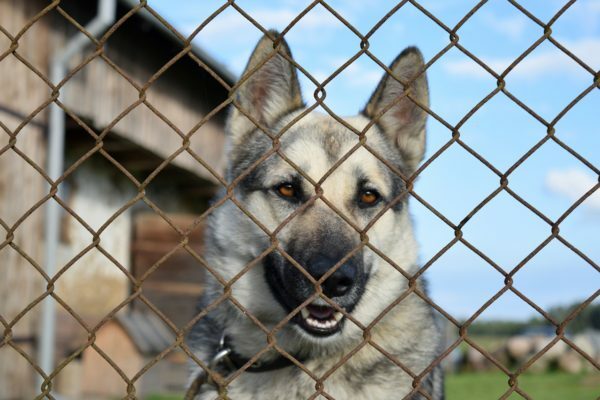 Barrier frustration often looks similar to true separation anxiety, however, it is simply your dog experiencing frustration when they can’t see or hear their owner or have access to certain spaces. Some dogs relax when they are allowed to roam freely in their home. This article What To Do if Your Dog Hates His Crate will allow you to start to think outside of the kennel! In fact, Kayla’s dog Barley will bark and dig and pant and whine inside of a crate when left alone (despite sleeping fine in the crate at night or during meals). If he’s given more space, he acts much calmer when left alone. Kayla no longer uses the crate, and along with some smart training, Barley’s separation anxiety is much better! It is important to teach your dog independence. Some dogs are naturally quite independent, and others prefer to be close to you at all times. Those dogs may have to learn that they can settle and be calm even when they are left alone. I suggest Dr. Karen Overall’s relaxation protocol. It is also important to introduce the crate slowly, and with the use of positive reinforcement. Aside from these behavior issues, your dog might be experiencing boredom. A crate is not an ideal solution for someone who is away from the home for large portions of time, several days per week. Dogs need enrichment and exercise. Not to mention, dogs are social creatures. Being confined all day with nothing to do can cause frustration and boredom and can manifest as destruction. I still believe a crate can be helpful and is a good solution for some dogs — even for some dogs with separation anxiety. In fact, some dogs are actually more relaxed in their crate and seek it out for comfort. But keep in mind, an escape-proof crate isn’t ALWAYS the right solution. We must be willing to consider what’s best for each individual dog and adjust the plan to meet her needs. Using an exercise pen or baby gate, to section-off rooms or levels within the house might be a good alternative for your dog. But ultimately, if your dog suffers from separation anxiety, you need to find a certified professional to help you create an individual training protocol. Among such professional organizations, you might look for a Certified Dog Behaviour Consultant, a Certified Professional Behaviour Consultant, or a Veterinary Behaviourist. Journey Dog Training works with separation anxiety using our $20/month unlimited email support plan (best paired with a dog behavior consulting call to get the ball rolling on day one). Practice. Practice leaving your dog for tolerable amounts of time and pair it with something your dog loves. This might just start with leaving the room. Slowly increase the amount of time you are gone and the distance from them without ever letting your dog rise above their threshold (tolerance level). If you only do one thing to help your dog with separation anxiety, make it this. In one study of dogs with separation anxiety, showed that systematically increasing the amount of time that you leave the dog alone was the most “critical element” in the treatment of separation anxiety. Desensitization to departure cues: These cues can be anything from grabbing your keys, putting on your coat, or could even start as early as your morning shower! Try to change these up so it doesn’t become predictable. Also, work on desensitization to these departure cues. For example, pick up your keys and sit down on the couch to watch TV. Put on your coat and fold the laundry. Put on your shoes and make dinner. Remote treat dispenser. A remote treat dispenser can be a helpful tool to teach independence as you begin to increase the time of your absence. You can start with a high release-rate of treats, and slowly decrease the interval that the treats are released. Once you reach a low rate of treats being released, try increasing the amount of time you are gone and increase the rate of treat-release. Medication: There are a lot of options out there for treating anxiety with pharmaceuticals. Clomipramine is a commonly used anxiety medication for aid in the treatment of separation anxiety. Medication can help to keep your dog below their threshold level while you are working on your treatment plan. A study by King et al., (2000), showed that separation anxiety treatments were more successful when owners used Clomipramine alongside training. Other medication options might include short-term, fast acting anxiety medications that help your dog feel less anxious when you need to leave them alone longer than they may be able to normally tolerate. Important: Medication should be used in conjunction with a training program. Consult your veterinarian to discuss what medication might be right for your dog. Exercise: While important, it won’t “fix” your dog’s separation anxiety. However, it can certainly help a dog by dispersing excess energy. Enrichment: Puzzle toys, like the 23 listed in the link, are my go-to resposne for all dogs who spend the day alone. If the anxiety is severe, your dog may not have any interest in these items in your absence. But mental stimulation is always a good idea for every dog, when you’re home or not. If you are using these items in your absence, give them 10-15 minutes prior to your departure, not as you’re walking out the door. Also, make sure that you also offer these items when you are not planning to leave. The last thing we want is for your dog to assume a stuffed Kong means you’re leaving them! Management. This is important. If we never want our dog to go over their threshold level, it means we can never leave them alone for a length beyond their tolerance! Some alternatives might be daycare (if your dog enjoys being social with other dogs), having a sitter come to your home or taking your dog to a friend or family members home, or taking your dog with you when you can. The bottom line is that if you can avoid leaving your dog alone for longer than he can handle and slowly build up his tolerance to your absence (we can create a personalized $20 plan for you in our unlimited email support plan), you’re very likely to fix your dog’s separation anxiety. You don’t really need that expensive, indestructible crate after all. Can I Prevent Crate Destruction or Separation Anxiety? Yes, you can help to prevent your dog from developing separation anxiety or barrier frustration in the first place! Training your new dog to love their crate can be a fun exercise and a useful skill. Start at a young age if you have the option, and make the crate a safe and fun place to be. Remember, the crate should be situated in a quiet area of the house. Covering the bars in blankets can make the kennel more inviting than being fully exposed. Make sure it is easily accessible, a place to play, sleep without disturbance, and enjoy treats. Teach the cue “kennel-up” to your dog. This means asking your dog to enter the crate by using a verbal and/or hand signal and reward them for entering. Go slow! Make training fun and easy, and set your dog up to be successful. In other words, keep training sessions short, sweet and stress-free! Think about how much fun you have playing a game when it’s straightforward and you are winning. Likewise, think how frustrating it is when it is too hard for your skill level. If you’re anything like me, you go back to something more fun and rewarding given the opportunity. The idea is to prevent stress in the first place by never letting it manifest by moving slowly towards your end-goal. Reward your dog every time you ask them to enter their crate with a high-value treat. If you want the crate to be the best time of day, make it a hotdog prize rather than a piece of apple. Be motivating and make crate time fun. Practice using the crate throughout the day while you are home. Use the crate as a punishment tool. Force your dog to go into the crate. Make it their choice! Expect to use the crate successfully without training your dog to think it’s fun. Leave them for too long in the beginning. Work up to longer durations over a period of time. The pace of training should be decided by your dog, not you. Ignore distress in your dog. Only use the crate when you are leaving. The crate will become a departure cue and could become stressful for your dog. Leave them without anything to do while confined. If you are at all concerned that your dog may be experiencing separation anxiety, the best advice I can give you is to consult a professional who understands how to treat separation anxiety using modern, science-based methods. Someone who is knowledgeable and has experience working with separation anxiety in dogs can help you design an individual treatment plan. Separation anxiety can be stressful and can sometimes feel hopeless. But it doesn’t have to! Just remember, a bigger, better, iron-clad crate won’t fix the problem. Teaching your dog to love their crate, or trying an alternative just might be the solution you need. There are many customizable options that can help you with everything from teaching your new puppy to love their crate, to dealing with separation anxiety and barrier frustration (and everything in between). King, J. N., Simpson, B. S., Overall, K. L., Appleby, D., Pageat, P., Ross, C., … & Muller, G. (2000). Treatment of separation anxiety in dogs with clomipramine: results from a prospective, randomized, double-blind, placebo-controlled, parallel-group, multicenter clinical trial. Applied Animal Behaviour Science, 67(4), 255-275.